For Beltane, we had our annual retreat. 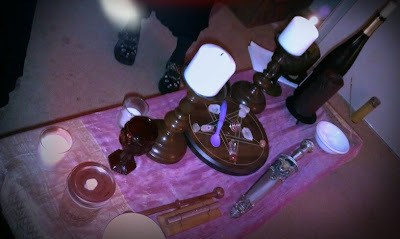 Due to many different factors, our retreat took place at one of our coven sisters' homes. In addition to our Beltane ritual, we made lotions, learned about astrology, made scrying mirrors, did some witchy shopping, practiced scrying, sung karaoke and had a lot of fun. As always, we ate well, with homemade doughnuts and fruit, yummy sandwiches, fajitas, chili, mini pizzas and more. All in varying shades of vegan-ness. Also, I personally learned that iguana's love vegan cornbread. We had a lot of fun. For our May all-coven meeting, we visited the LA County Arboretum in Arcadia. The Arboretum is an oasis of trees, beautiful gardens- including rose and herb gardens, and a few gorgeous waterfalls. It also is home to LOTS of peacocks. The peacocks acted as thought hey were used to posing for cameras- spreading their tail feathers and rotating around. If I didn't know better, I'd think they were trained. It was a very beautiful afternoon spent together. Afterwards, we headed over to Barney's Beanery in Pasadena for a few drinks and snacks, while laughing about boys and geography.